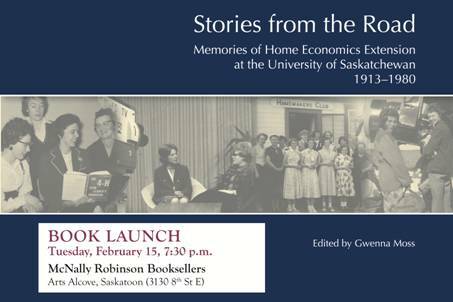 It would only seem fair, since I recently promoted the University of Manitoba's Faculty of Human Ecology book launch, More Than Memories, that I acknowledge the University of Saskatchewan Home Economics Extension book launch occurring in Saskatoon. Especially since Saskatchewan was where I launched my career, and got to network with some interesting individuals, such as Kim Kennet who is blogging her African voyage. 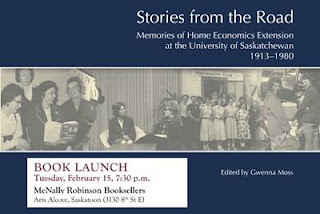 If you are driving by the McNally Robinson in Saskatoon, be sure to check it out! The Back Cover Reads: Travelling over icy, snowy, or muddy roads . . . driving long hours to get to the next achievement day or field day . . . flying into northern settlements . . . staying in small town hotels . . . 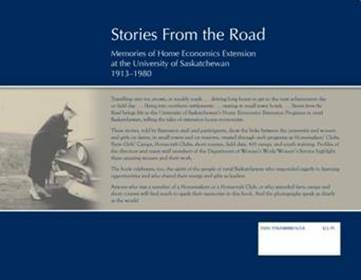 Stories from the Road brings life to the University of Saskatchewan’s Home Economics Extension Programs in rural Saskatchewan, telling the tales of extension home economists. These stories, told by Extension staff and participants, show the links between the university and women and girls on farms, in small towns and on reserves, created through such programs as Homemakers’ Clubs, Farm Girls’ Camps, Homecraft Clubs, short courses, field days, 4-H camps, and youth training. Profiles of the directors and many staff members of the Department of Women’s Work/Women’s Service highlight these amazing women and their work. The book celebrates, too, the spirit of the people of rural Saskatchewan who responded eagerly to learning opportunities and who shared their energy and gifts as leaders. Anyone who was a member of a Homemakers or a Homecraft Club, or who attended farm camps and short courses will find much to spark their memories in this book. And the photographs speak as clearly as the words!